I have been wanting to do an in-home lifestyle session with Caitlin, Travis, and their dogs for quite some time now and when she recently asked me to photograph a sweet surprise announcement for them, I was ecstatic! Caitlin is one of my absolute best friends! We stood by each other in our weddings and shared our hearts desires and dreams with each other many times during the years that we lived together. One of Caitlin’s biggest desires in life was to be a momma! When Travis came into Caitlin’s life, it was obvious they would be married one day and the desires of her heart began to unfold into a beautiful story. After lots of prayers, they found out recently that they are expecting! Caitlin came over one night and when she surprised me with the news, I ugly cried…(for real. Like full on Oprah Winfrey tear fest)! 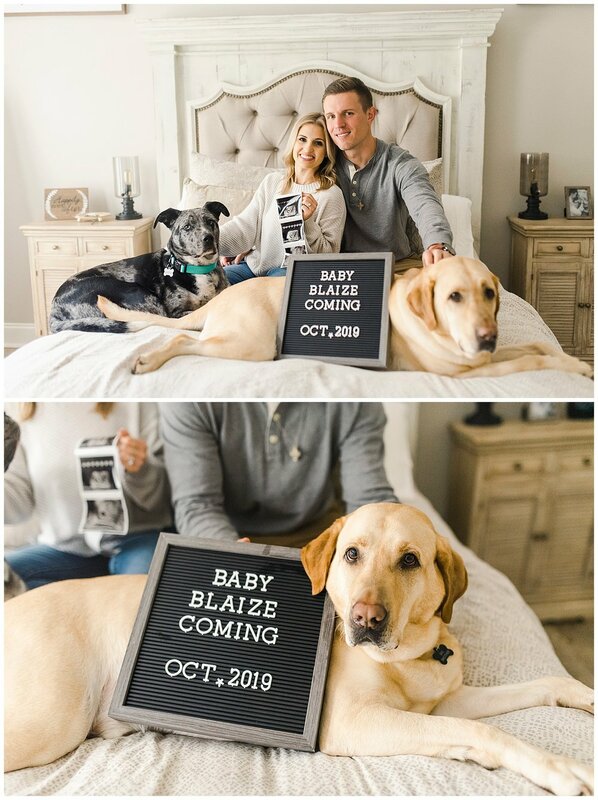 Then she asked me to take this adorable in-home lifestyle pregnancy announcement with their pups, Tucker and Baxter, and I ugly cried again when I was editing their photos. My heart is overjoyed with this new little blessing and I’m so ready to be a “Tante” to Baby Blaize!